Depending on when you visit the country, but knowing what to pack for Norway is an important part for the trip. Even more so if you had doing the Trolltunga hike as what to pack for Trolltunga is massively important for safety reasons too. We spent some time exploring Norway, having visited Bergen, road tripped to Odda while exploring the small towns on the way. I have also shared posts on things to do in Bergen, shared tips on how to hike to Trolltunga, in addition to an extensive guide answering all your questions in a comprehensive guide to everything Trolltunga. 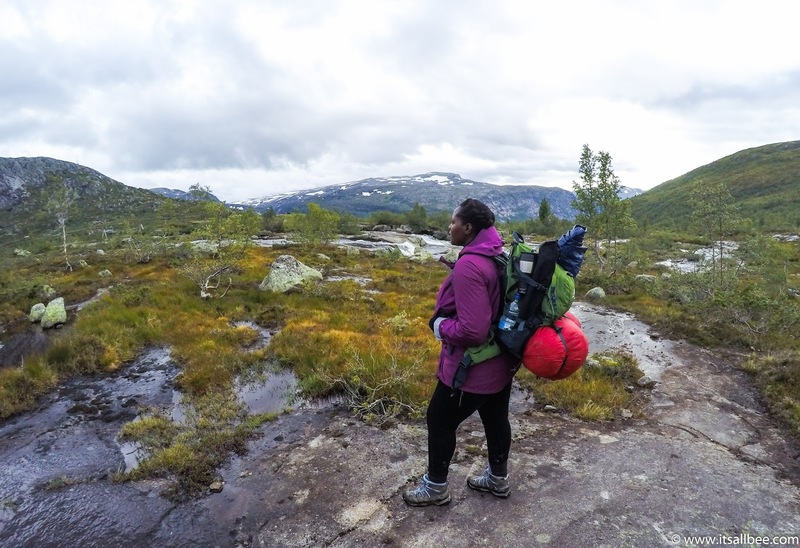 In this post, I thought I would address things to pack for Norway and include what to pack for hiking to Trolltunga which I thought to do in a separate post to the others. 1 What to Pack For Bergen Norway? 2 What do you wear in Norway? 2.1 What is the average temperature in Bergen Norway? 2.2 What is the best time of year to visit Norway? 2.3 What is the weather like in Norway in July? 4 What To Pack For Trolltunga Hike? What to Pack For Bergen Norway? Padded Jacked or wool coat. Leggings – You can wear these under dresses and add boots. Avoid wearing jeans in cold weather as they tend to not hold any heat. Stick to thicker materials like corduroys or cotton which you can also pair up with thermals underneath. What do you wear in Norway? What you wear in Norway really details on the above timings and the activities you are doing in Norway. What is the average temperature in Bergen Norway? Bergen: Annual Weather Averages. July is the hottest month in Bergen with an average temperature of 15°C (59°F) and the coldest is January at 2°C (35°F) with the most daily sunshine hours at 8 in June. The wettest month is December with an average of 270mm of rain. What is the best time of year to visit Norway? When you visit or best time to visit Norway really depends on what you plan on doing. Jun-Aug promises long days and the fabled midnight sun ideal for hiking, cycling or cruising. May and Sep offer mild temperatures, fewer crowds, and gorgeous natural colours. We chose to visit Norway end of August into September. What is the weather like in Norway in July? July is one of the hottest months of the year in Norway as temperatures average 20°C (68°F), reaching an average high of over 26°C. The scenery at this time is said to be incredibly beautiful with lush green landscapes luxuriant with blossoming flowers, and breath-taking waterfalls. Ankle or Knee-high Boots (women). Mountaineering Jacket suitable for the weather. What To Pack For Trolltunga Hike? What to pack for the Trolltunga Hike very much depends on your plans for a day hike or Trolltunga camping and hike. With that in mind, I have split the packing list for Trolltunga into two; day hike and camping hike. Food Pack with energy snacks. We made granola bars before we left. So make sure you pack protein and high energy snacks as the hike is long and arduous. A good 10+ hours of walking should be considered for each day. Gloves: I have a light and a heavier pair depending on the weather. Thermals: Weather change can be sudden. Layers will keep you warm but also easier to slip off when it gets warmer. Hiking boots : We saw so many people hiking in trainers, converse and I think I even spotted someone in flip flops which were not really suitable for the terrain or the hiking in general. Just like you wouldn’t do a marathon in hiking boots, so pack accordingly for the activity you are embarking on. Hiking boots for me are a lot more comfortable and are built for the terrain. Walking Poles – You will thank me! First Aid Kit – Because accidents can happen. Head Torch: A lot easier as they keep your hands free. Beanie Hat: The higher you get the more variable the temperature becomes. The hat will help to keep your body warm. Especially at night time if you are camping overnight. Sunscreen: It was cold when we set off the hike but when we got to the summit at Trolltunga the sun was out and it was intense so bring some sunscreen to protect yourselves. Camera – This is an obvious one as the views are so beautiful you won’t have time for Instagram but you will want to capture the beautiful landscapes in Norway. Phone: There no reception along the trail so any calls or weather updates will need to be done in the car park. You will need your phone should anything happen you would be able to send a text. Numbers below for emergencies Make sure you bring battery chargers. Charger blocks: Lithium batteries in phones tend to lose their charge quickly in the cold, so to make sure your phone is a charge should you need to make an emergency call. Contact details for emergency services in Odda. Water Bottle or Water Camel: You only need the first bottle and on the way, there are many water streams along the way where you can refill. Mountain whistle: Hopefully nothing happens but this one should be packed in your first aid kit. Should anything happen, you may need this to draw attention to where you are located if you get stuck or injured. Spare change of clothes and at least 2-3 pairs of socks: Leave the spare change of clothes in the car but take an additional pair of socks with you. Plastic bags: There are no rubbish bins so don’t be like some of the people who have left piles of rubbish close to the summit. Some large groups get to the end of the hike and have food as they celebrate the end of the hike. It appears many leave their rubbish in the last 2km of the hike. There are no cleaners on the trail so be kind to the environment and bring your rubbish back down to the car park with you. Plastic bags will also be handy to put your dirty clothes in from the hike. Map and Compass and not really needed on this hike as the trail is clearly marked. If you veer off course then they might be handy. On this trail though you don’t need them. Wipes/Tissues for when nature calls or just cleaning hands after eating or general hygiene. 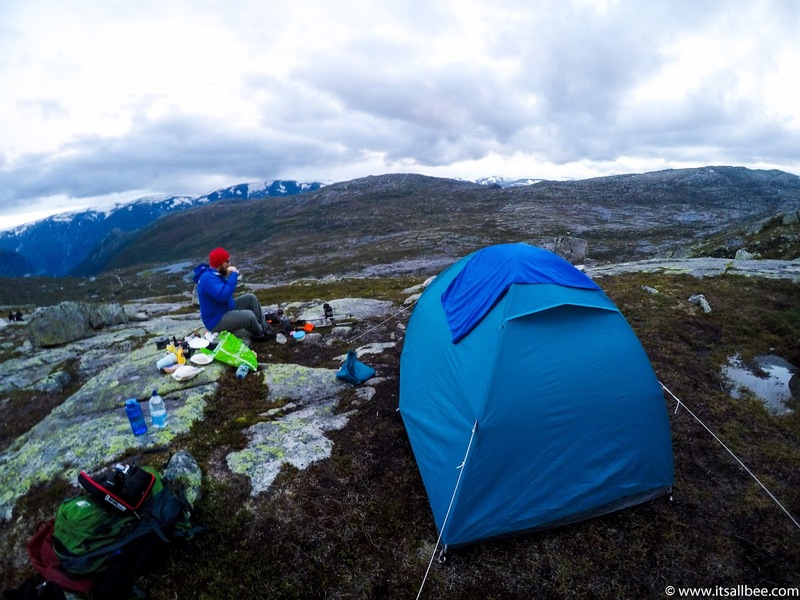 In addition to the day hike item – these are items you will most likely need if camping on top at Trolltunga. Tent – Also make sure you have practiced putting up the tent. I have had to help a few people put their tents up who came camping with new tents they had little knowledge of putting them up. You can also opt for an easy tent like the 2-second tent . Sleeping Bag – As you are going to be up in the mountains with glaciers nearby be sure to pack a warm sleeping bag as most of the spot on the trail are exposed with not a lot of mountain to shield from winds. Sleeping Matt: It helps to have something between you and the ground as it gets cold and frosty at night. Camping Stove and plastic or paper crockery. This is the Camping stove we got and comes in a small little orange box that’s easy to pack. Food: If camping overnight it helps to pack some items from home. We packed some tea bags, sugar, and the rest of the food to cook overnight we bought when we were in Odda. More can tips and equipment can be found in my previous post on hiking in Snowdonia. We planning a trip to Norway next July and I have been trying to figure out what clothes to pack for Norway in July or August. Between this post on your Bergen post I think I have an idea. Thank you so much, I am just in awe of your travel blog. Just wondering if there is any difference in what should I pack for a cruise to Norway as well as we may be considering a cruise as well. What do you think? Hi Newton, what clothes to pack for Norway, really depend on when you are going, what activities you have planned so it won’t matter much if the trip is for a cruise in Norway or hiking. Its really what the weather is like and the activity. So if your activities will involve exploring cities alone then you may be packing lighter then say if you also need to consider packing for hiking or adventure sports in Norway. Hopefully my post gives you and idea what to pack for Norway as I have based it on our exploration of Bergen and the packing like for Trolltunga. Wow! This looks like such a beautiful place from the pictures. I’m jealous that I haven’t been myself. I would love to visit Bergen, hike to Trolltunga, and check out some of the surrounding places. The packing lists for Trolltunga and the lists for what to pack for Norway you provided are really comprehensive. Thanks for sharing and creating some travel envy! Thanks, Sam, I am glad you found the tips on what to pack for Norway useful. Aww. This Norway packing guide is a life saver. I’ve actually sat in front of my closet for a while now and still my mind is blank because I don’t know what it’s like there. It’s my first visit and the last thing I want now is to pack and get there to realize it’s not enough. Thanks for this. Great guide. I am heading to December and looking for tips on what to pack for norway in Winter. Any additional tips? Thermals are your friend!!! Norway is going to be super cold during the winter considering its geographical location. Yep, pack wisely! Thanks for all the helpful tips on what to pack for Norway! I am going to Norway in May and I’m hoping there isn’t too much snow so I can hike this! Question- Where did you park your car? Was there a parking lot? If so how much did it cost? Thanks again for all the help! Parking in Bergen wasnt great. I wouldnt recommend having a car in Bergen but if you are doing trips outside the city then its a must. As for parking that are car parks but not the most cost effective. So best not to have one in Bergen.